India's Amazing 102-Year-Old Runner Racks Up Two More Gold Medals : Goats and Soda Man Kaur just earned two golds in the World Masters Athletics Championship in Spain. And she didn't even start running until she was 93! 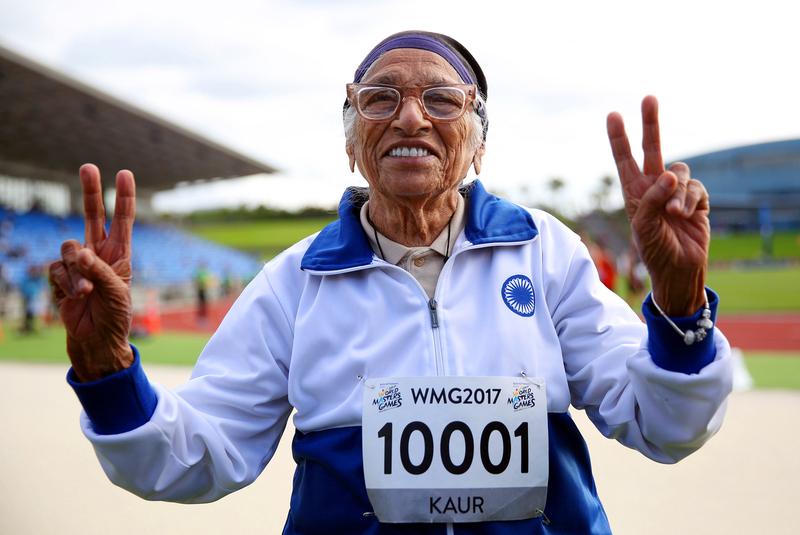 Man Kaur of India celebrates after competing in the 100-meter sprint in the 100+ age category at the World Masters Games in Auckland, New Zealand, in April 2017. Kaur has a message for younger folks: Keep away from junk food and stick to an exercise regimen! Her own routine is impressive for any age. She wakes up at 4 a.m., bathes, washes clothes, makes tea, recites prayers until about 7 a.m. Sometimes she goes to the Gurdwara, the place of worship for Sikhs, other times she prays at home. And then she goes to the track for an hour of sprinting practice. "She's an inspiration and I'm so happy to have met her," says 40-year-old runner Raksha Muni. Now you may be thinking ... is she really 102? Kaur doesn't have proof of her age but her oldest child does. When her baby's birth certificate was issued 81 years ago, Kaur was 20, so you do the math. The diminutive Kaur hasn't been a lifetime runner. Far from it. She started running in 2009, when her son, Gurdev Singh, who's now 80, urged her to take up track and field. Singh, the second of her three children, is her coach as well as cheerleader. He also a long-time track competitor: "I was on my college track team and in school, I ran track and I played on the [soccer] team. I have been running in the master level for the last 25 years." Singh has amassed more than 80 racing medals since 1992. What made him take his then 93-year-old mother to the track? It was mainly a whim, he explains — but also a desire to keep her fit. "She was very well, with no health problems, and she moved fast. So I took her to the university track with me and asked her to run 400 meters. She did it, slowly, and I thought 'Yes, She can do it.' "
Kaur enjoyed it enough to want to return. She liked running, she said. And quickly she started to improve. Two years later, given how well she was doing, her son registered her for international events he was participating in. Kaur agreed with no hesitation. And she hasn't stopped. Last year, the great-grandmother was selected for the American Master Games in Canada, where won gold for her 81-second 100-meter dash. "After that she was very excited because so many people wanted to have a photo with her," says Singh. Her competition, most in their 70s and 80s, cheered wildly for her. She was a sensation! Singh and his two siblings were natural athletes, but Kaur never had the chance to find out if she was good at sports. She was born in pre-partition India in 1916. Her mother died in childbirth; Kaur was raised by her paternal grandparents in Patiala, an erstwhile kingdom that was disbanded by the British after India gained independence. Her grandparents tried to send her to school when she was little, she recalls with a big grin, but she just wasn't interested in studying. "I would play truant. I preferred to run around, and then work a little to earn some money." In her childhood, she recalls earning coins for weaving drawstrings for pajamas as well as collecting twigs from the neem tree to sell as natural toothbrushes. In between, she milled wheat by hand and spun thread. In the early 1930s, she found employment as a nanny and maid to one of the 360 queens of the maharaja of Patiala. She worked in the palace, serving one of the queens and minding the prince. Kaur married in 1934 and went on to have three children. Later, she became a cook, working for families in many homes across the city. She's Won ... How Many Gold Medals?! Since starting her competitive career, Kaur has run in meets in Canada, Malaysia, New Zealand, Singapore and Taiwan. And she's nailed 32 gold medals. In Auckland, New Zealand this April, she won gold for the 100-meter and 200-meter runs as well as two new sports: javelin and shot put. In those two events, she's sometimes the only contestant in her age bracket, so winning gold is a sure thing. But she doesn't just show up. In Auckland, Kaur broke the master category world record in javelin with her 16-foot throw. With her son's help, she works hard to become better and faster. Her 100-meter run took 74 seconds in New Zealand in 2017; now it is down to 70. "You know, it's difficult to shave off even one second!" Singh says with a laugh. "She has improved by four!" To improve her speed, Kaur tries to go to the track every day. Three days a week, she does shot put and javelin practice; the rest of the week, Singh puts her through her paces on the track. On sprint days she does runs of 30 meters, 40 meters and 50 meters. These are alternated with days when she does 100-meter and 200-meter runs. "And if the weather is inclement, I go to the gym and lift weights," she says. Plus there's a strict diet. She drinks kefir, soy milk and fresh juice in the mornings. At 11 a.m. she has a meal of lentils, vegetables and chapati — flat bread — made from sprouted wheat. At 4 p.m. it's time for wheatgrass juice plus nuts and seeds. And in the evening, it's again chapati with lentils, vegetables and a glass of soy milk. The whole exercise is a labor of love, says Singh. "There is no prize money, in fact we have to pay for participation." He fuels his passion for running with his life savings. He sold his business when his wife died; "My son and daughter live abroad so I felt free to do this." He and his mother stick with it because they both love it. "It is for our health and at this age, we are winning medals, so people also get inspired." In January 2017, the government finally acknowledged their efforts in putting India on the map for senior sports, giving them an apartment close to the university stadium in Patiala. Singh does the cooking, Kaur does the housework, including laundry, and cleaning. It's a simple life, but Singh says, when his savings run out, they will have to stop. "We are not greedy persons," he says. "It would be nice if the government supported just our actual expenses." Traveling is hard on them; living out of hotels and going to publicity events is not all that fun, Kaur says. "And abroad, they don't even offer you a cup of tea most times," she says, sadly. But the grandmother of nine (and great-grandmother of 14) keeps at it. She's reportedly looking forward to the 2020 Masters games in Japan. Life really comes full circle, Singh observes. So many years ago, his mother worked at the Patiala palace as a maid, getting a monthly salary of 10 rupees (equivalent to 15 cents today). "After winning the Canadian competition in 2016, she was called to participate in a 5-kilometer run in Patiala [of which she ran the first few hundred meters]-- and invited to spend the night at the palace. Ironically, she was given the bedroom of the queen she'd worked for!" Kaur shakes her head and smiles, quoting a Punjabi saying: "What you ask for, you never get. It's better to accept your blessings as they come."